FREE wireless Nurit 8000 with merchant account! The NURIT 8000S gives you precisely what you want in a portable payment device—secure and reliable transaction processing, exceptional flexibility to tailor solutions to your requirements, and best of all, a proven track record that’s second to none. When business is busy and customers are on the go, you need payment to be as fast and effortless as possible. The NURIT 8000S offers a large, backlit graphical display and keypad, and convenient touch screen with signature capture capability that allows customers to quickly approve and sign for transactions without juggling pen and paper. Drop-down, on-screen menus and a virtual keyboard simplify usage and minimize errors. Support for a broad spectrum of short and long-range wireless options lets you process transactions any time, anywhere. In addition, rechargeable batteries ensure the device keeps working for you throughout your longest days. The NURIT 8000S securely and efficiently handles a variety of credit, debit, EBT, and value-added transactions such as gift and loyalty cards. The device includes a built-in PIN pad and a fast, quiet, graphical thermal printer. In addition, your transactions and customer data are protected with the help of state-of-the-art anti-fraud features. Further, the device is durable and dependable enough to stand up to the most demanding conditions. The NURIT 8000 is a flexible, lightweight, handheld terminal that enables fast, secure, error-free transactions for on-the-go merchants. The sophisticated multi-application platform supports a range of payment & value-added services - including credit, debit, T&E, EBT, smart cards, prepaid, loyalty, gift & proprietary cards - as well as business management solutions such as inventory control, dispatch, delivery, etc. The unit supports a variety of cellular networks, including GSM/GPRS, Mobitex, CDPD, DataTac, and CDMA. 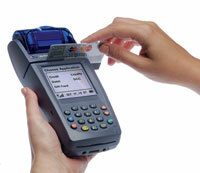 The terminal includes an easy-to-load thermal printer, a touch screen, built-in PIN Pad, and EMV smart card reader.